Note: I’ve used three categories to summarize my preferences: Must Try, Worth Trying, and Would Pass. This BBQ sauce won 1st place for Creative BBQ in 2016. This sauce had a tangy, sour taste that reminded me of artificial orange flavouring. The powdered, orange flavoured drink mix, Tang, came to mind. I did not like it. This sauce tasted fine, like a standard, classic buffalo wing sauce that could have come from a bottle. Nothing special about it, which is why I would suggest people spend their money and calories on other vendors instead. This was the only vendor that came from another continent – all the way from Australia! 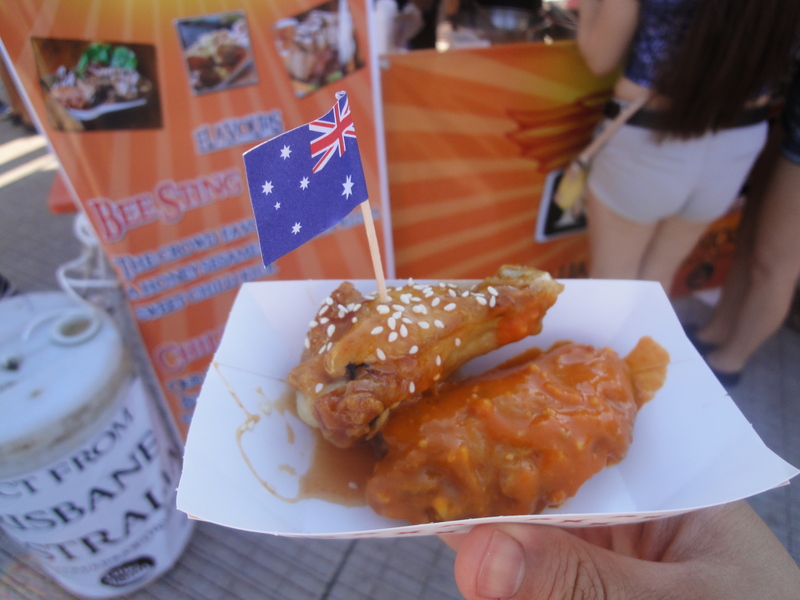 This vendor is Australia’s take on North American chicken wings. 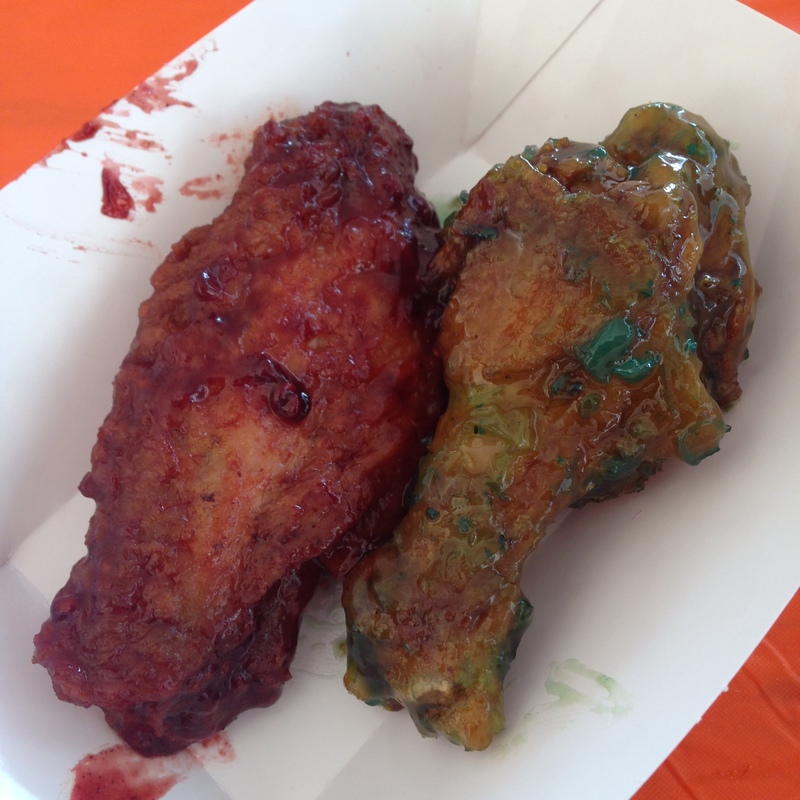 They were also the only vendor that tossed each and every wing to order!!! 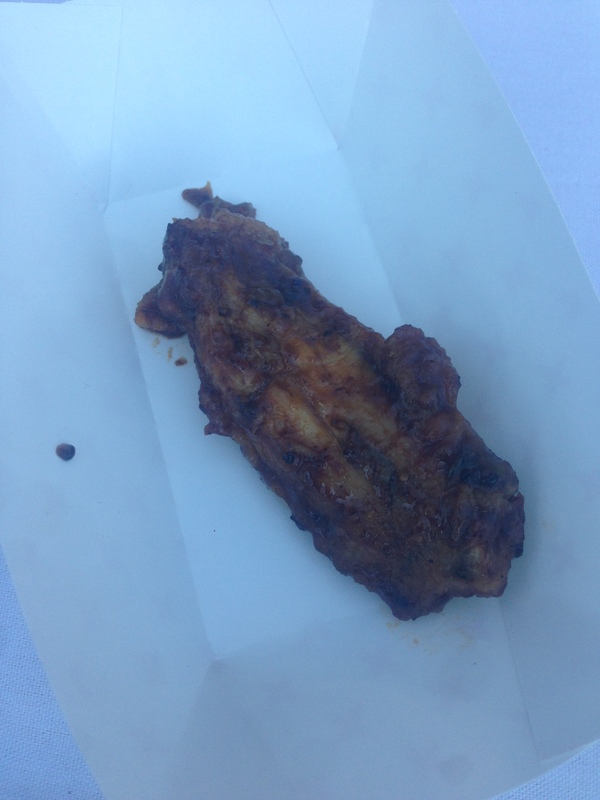 I was very disappointed that all of the other vendors tossed medium to large batches of wings at once, allowing them to get soggy. Really fun and chill people too. This hot sauce is spicy and it’s their trilogy of chillies. It was very good. It had a very unique flavour compared to all of the other hot sauces that we tried at the festival. I think I tasted mustard flavours. This flavour won 2nd place for 2016’s Creative Sweet sauce. Once again, their seasonings had unique flavours that stood out from the other vendors. I had heard good things about their roasted garlic/garlic parmesan chicken wings, but unfortunately they weren’t available at the festival. Apparently, the sauce hadn’t turned out the way they wanted it to. We did, however, try both of their 2016 award winning sauces. La Nova’s Peanut Butter and Jelly won 1st place for Craft Wings in 2016. The sauce was dark, thick, and hearty with sweetness from brown sugar and an after taste of jelly. I really didn’t like the peanut butter pairing with chicken wings. This won 2nd place for Traditional BBQ sauce in 2016. This sauce was thick and hearty with a slight tangy flavour. It reminded me of worcestershire sauce and steak sauces like HP or A1. Personally, I don’t like those types of BBQ sauce, so this was a miss for me. This is a very popular and well known chain restaurant for wings. They also won 3rd place for Creative BBQ in 2016. They were the only vendors that had fun giveaways like pens shaped like wrenches, wet naps, and Twizzlers. We really tried to give them a chance, but their sauces fell short for us. This sauce was very buttery, but in terms of flavour, it was bland and lacked garlic flavour. This sauce was mildly flavoured and had an interesting mix of ranch sauce and mild hot sauce. Rocky’s won 3rd place for the 2016 Traditional Extra Hot sauce. They had some unique flavours on their menu. One in particular was pink and fruit based and received good reviews. They said they didn’t use any food colouring in the sauce, but I didn’t try it, because the colour just didn’t look appetizing to me. The sauce was mild in heat and hearty. 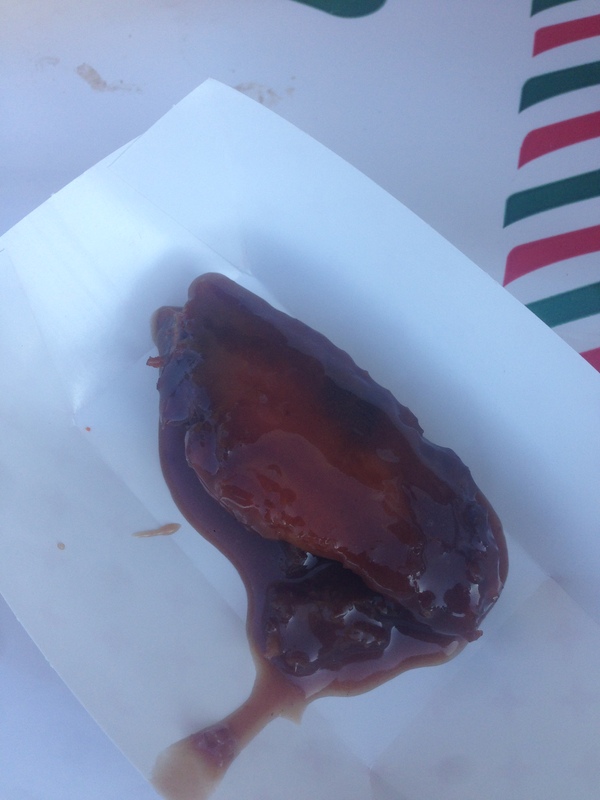 The sauce tasted fine, but I didn’t like the texture of the wings, because it tasted as if they had slow cooked the wings in the sauce. Scallywags won 2nd place for their Traditional Extra Hot Sauce in 2016. We didn’t try any of the extra hot sauces at the festival. 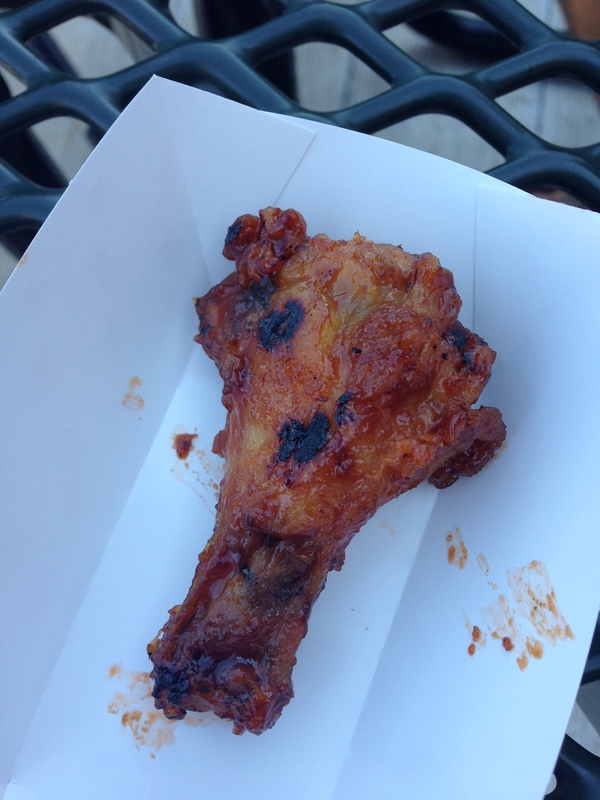 This was my least favourite chicken wing sauce from the festival. It had an unnatural green colour and an odd combination of flavours that included mint and pineapple, I believe. This BBQ sauce had loganberries in it. Although the sauce was quite thick and heavy, the loganberry balanced it out quite nicely. The BBQ sauce was slightly tangy and mildly spiced. I liked it. In 2016, The Old Union Hotel cleaned up at the awards ceremony. They won 2nd place for the Creative BBQ, 2nd place for the Traditional Hot Sauce, and 3rd place for the Creative Sweet sauce. The sauces that we tried had really really good, unique, and well blended flavours. 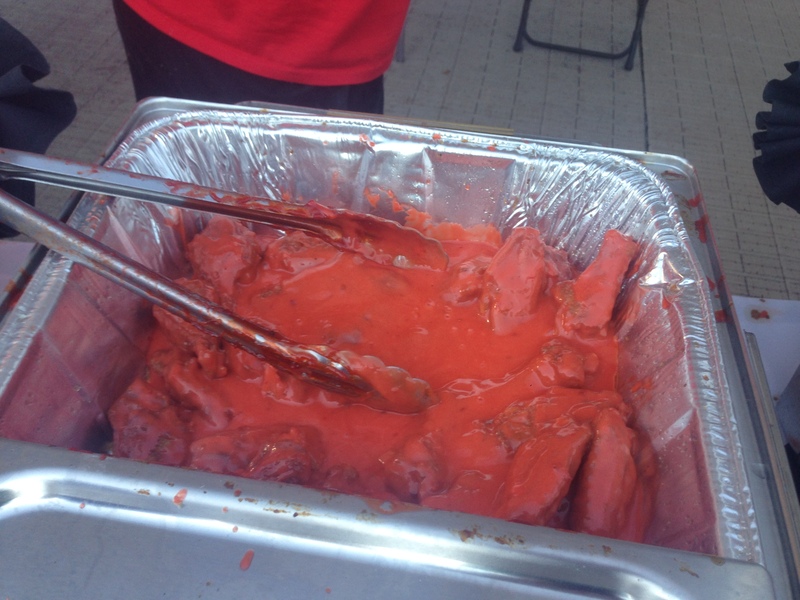 But what really set this vendor apart from the rest, in my opinion, was the texture and mouth feel of their sauces. They were perfectly balanced – buttery, rich, creamy, and thick, but not too heavy. This was one of our favourite sauces from the festival. It looked like a typical buffalo sauce but it tasted completely differently from what you would expect. It had great, bold and balanced flavours that really melted together well. I tasted hints of spicy mustard, tomato, ranch, smokey BBQ and an ever so mild touch of sweetness. It had medium heat. Once again, I want to emphasize that the texture and mouth feel of this sauce was the best – unlike anything I’ve tried before. This sauce had the characteristic acidic heat that you get from sriracha that kicks in later. It also had a nice sweet honey flavor. Flavour wise, I much prefered the Carolina Gold, but you still get the signature texture and mouth feel that set this vendor apart from all others. Wing Street is owned by the same parent company as Pizza Hut. They won 3rd place for the 2016 Traditional BBQ sauce. There wasn’t nearly enough seasoning on these wings, and it wasn’t peppery enough for my taste. This sauce was made with coarse grain mustard. It had good acidity and sweetness, but it didn’t have any smokey flavour. 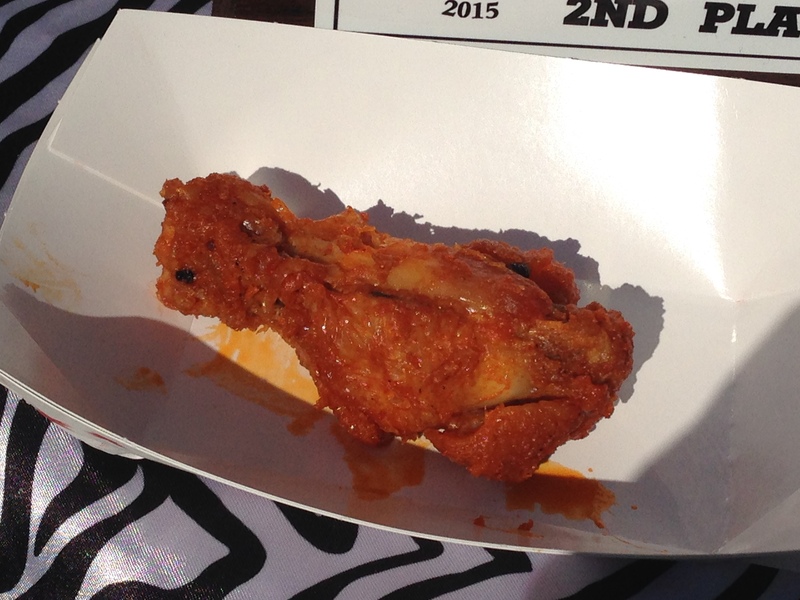 I set out on a mission to try at least one wing flavour from every single vendor at the 2016 National Buffalo Wing Festival. Windjammer’s is the only vendor that I wasn’t able to try, because they – unexpectedly – didn’t return for the second day of the festival. 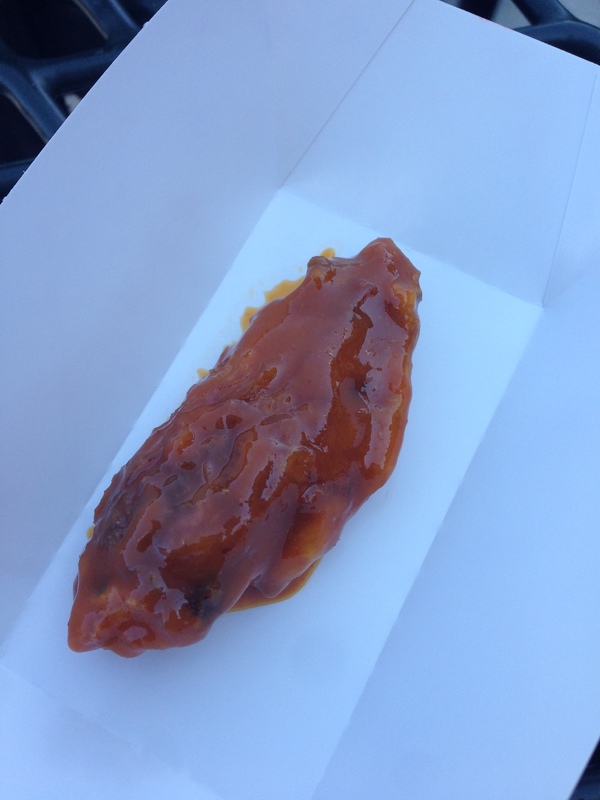 They had several fruit flavoured wing sauces that I was curious about and I had been looking forward to trying their Smokey Mountain Wings. If you by chance tried their wings, I would love to hear what you thought of them! 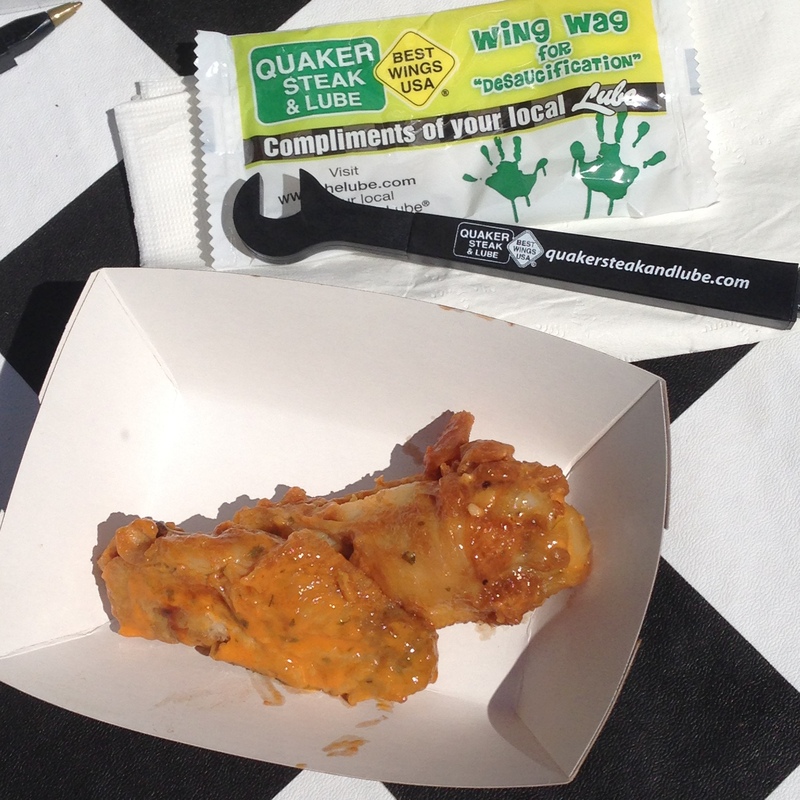 The National Buffalo Wing Festival is the only food festival that I’ve ever been to that had free alcohol samples! 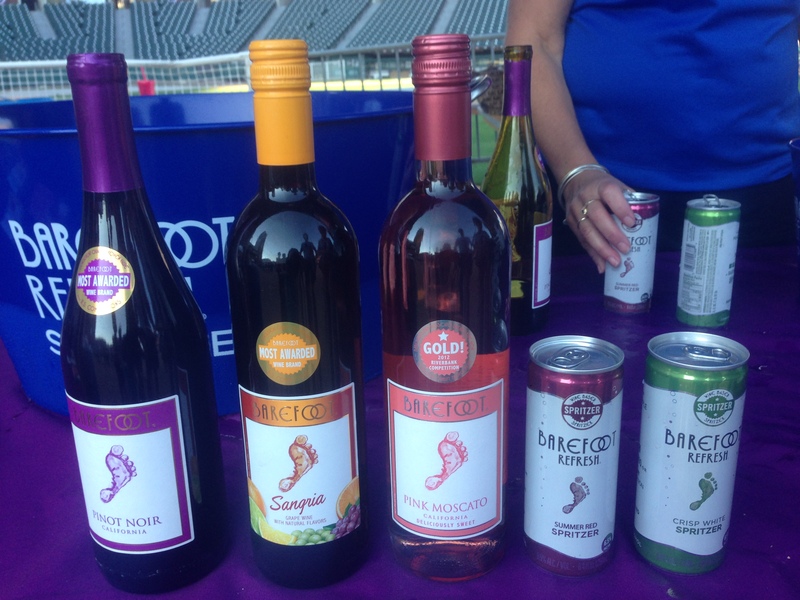 The Californian winery Barefoot was giving out free samples of their wines and wine spritzers. Their white wine spritzer was very good. It wasn’t too sweet and drank just like grape juice. I tried their famous Chicken Wing Soup. They like to call this their “No Bones About It” or “The Wing Without The Mess”. It was thick, hearty, and filling. It has a mild to medium heat. Also, they use chicken breast meat. It wasn’t at all what I was expecting. I can see why it’s so popular – it has a spicy and acidic flavour profile that reminds me of the very popular, Chinese hot and sour soup. There weren’t a lot of vendors selling dessert at the festival. Faletta’s was one of them. The vendors were very nice. 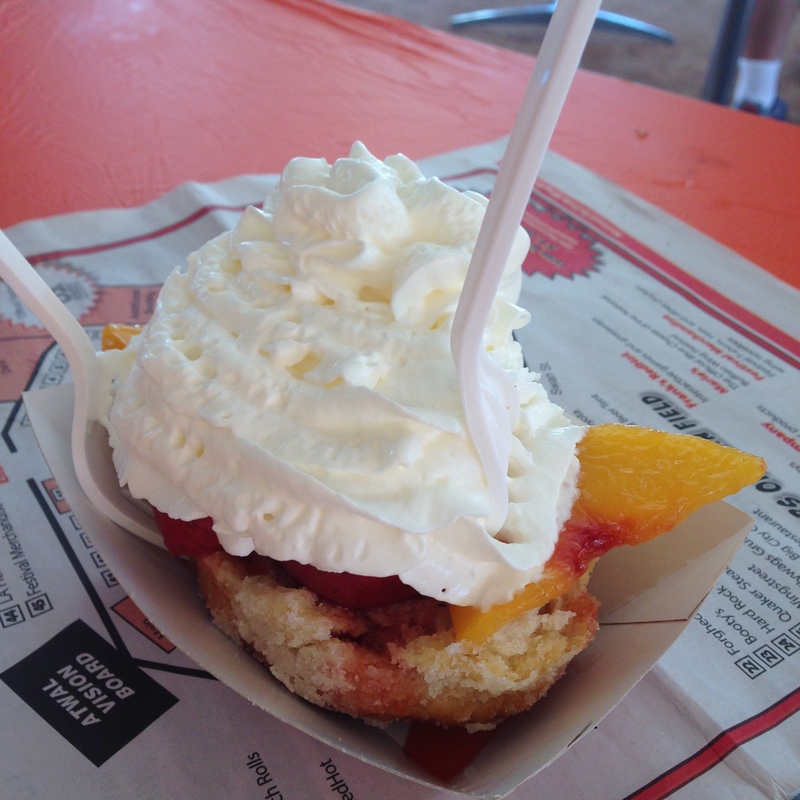 I had their Strawberry and Peach Shortcake. The biscuit was very good. The whipped cream, although from a can, was perfection. It was literally better than my whipped cream made from scratch. Although the peaches had too much almond extract in them for my tastes, the fruity and creamy dessert was the perfect finish for a wings day. I’m also going to recommend their Chicken Wing Rice Balls. They are made with chicken breast, rice, salsa, cheese, and hot sauce. The balls are then breaded, flash fried, and baked. Although I didn’t try them, I heard good reviews, and I am recommending them because they were very large and looked very filling. So I think they would be a very good value, price and quantity wise. 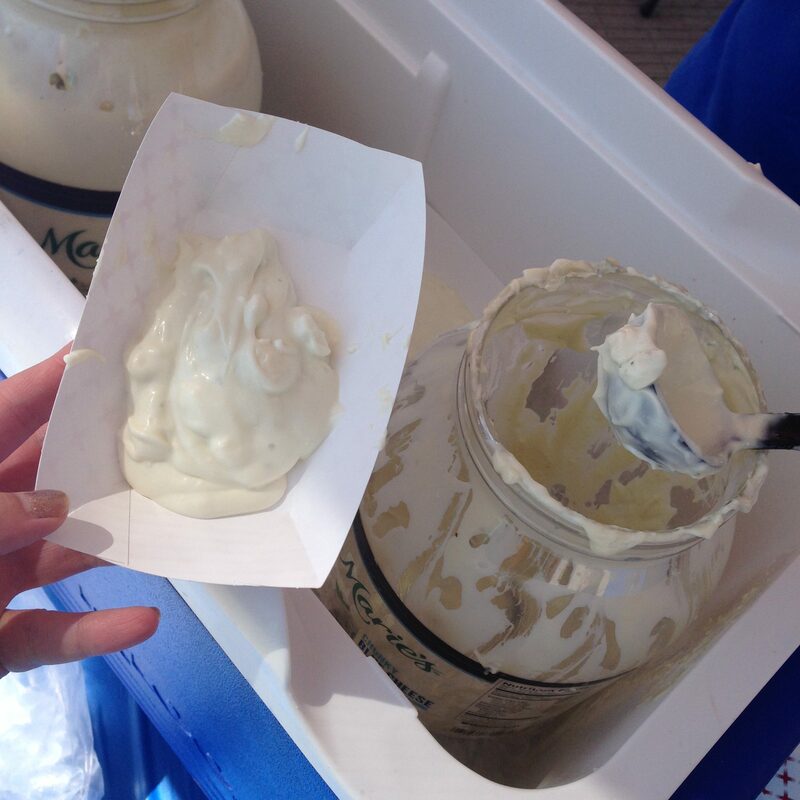 Marie’s provided Blue Cheese dip for everyone and filled pools for the wing bobbing competition. I noticed that in the USA, the most popular blue cheese dips aren’t very strong in blue cheese flavour. Marie’s blue cheese dip is light and cooling. It has more sour cream flavour than blue cheese. These crunch rolls were invented in Buffalo, NY, and are stuffed egg rolls that are battered and deep fried for 5 minutes. They have a thick and truly crunchy shell. These were selling for $3 each (cut into 2 pieces) and were very filling. The vendors were really nice and informative, too. These are made with white chicken meat, four cheeses, and buffalo hot sauce. These are made with Hungarian hot pepper and three cheeses. I loved the mild heat and the cheesiness of this crunch roll. We have an air popcorn machine and I make my own caramel popcorn (see recipe here), so I don’t normally buy popcorn. With prices like $6 for a large bag of kettle corn, I thought to myself, ‘This better be the best popcorn I’ve ever had’. And you know what? It really was. 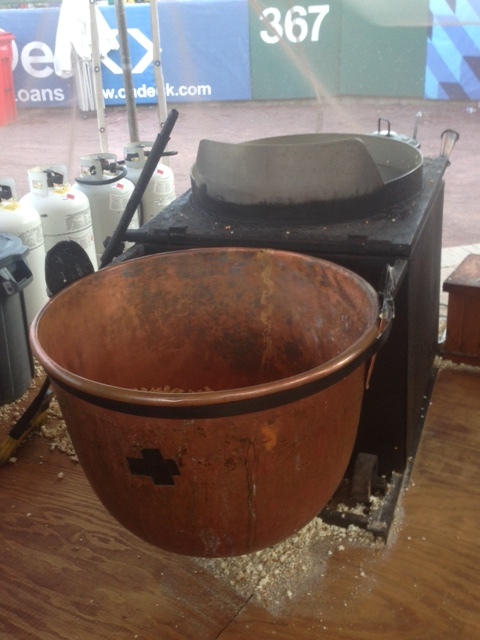 Pop in Bob’s Kettle Corn uses a large copper bowl and old fashioned methods of manually stirring the popcorn while it cooks. It’s because of this method that you get a delicious combination of sweet and savoury pieces of kettle corn. 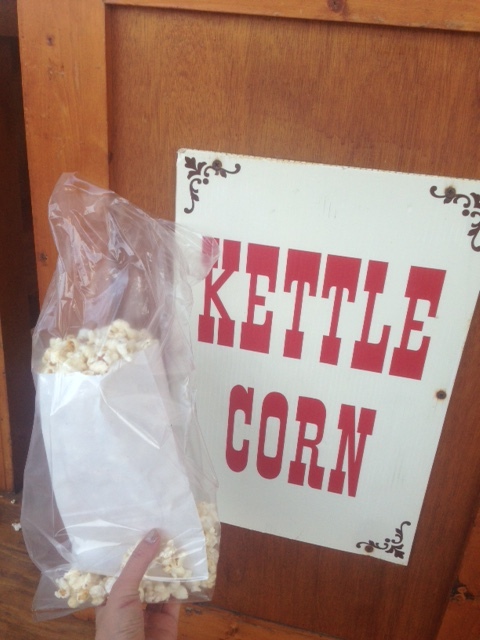 I don’t know how they do it, but their kettle corn has an invisible, crunchy layer of sugar. It has the perfect texture and flavour. The people working the booth were also really nice and friendly. 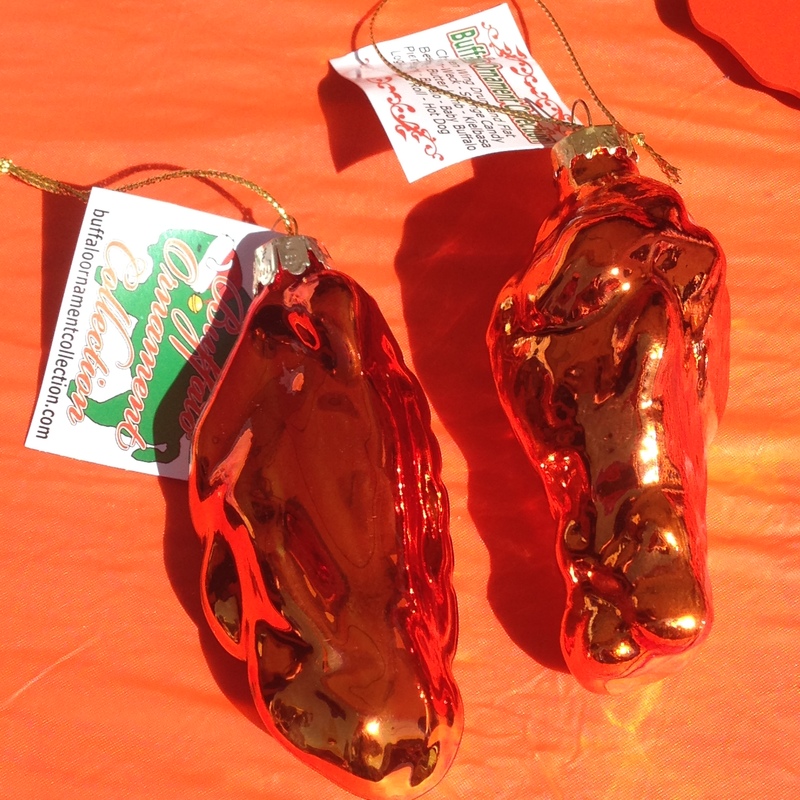 They were selling chicken wing Christmas tree ornaments (drums and flats sold separately) at the festival. Made by Buffalo Ornament Collection.